Strickland’s is a family owned and operated business that has been serving Ontario for over 30 years. 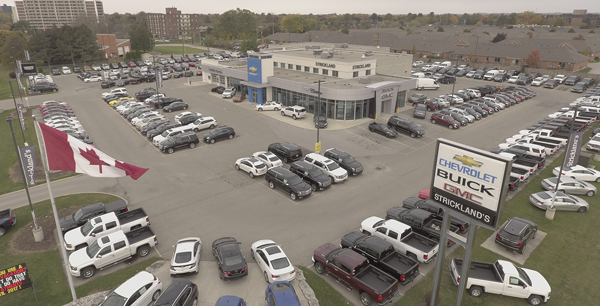 From modest beginnings we have grown to offer both new and used vehicles at our dealerships in Brantford, Stratford and Windsor. 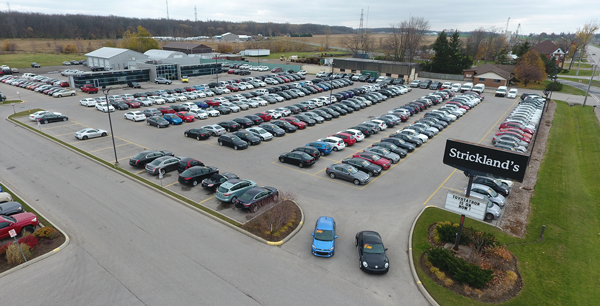 We stock over 250 new GM vehicles at our Brantford location, 200 new Toyota vehicles at our Stratford location and over 800 late model used cars of all makes, models and price ranges. Originating as a family owned and operated business in 1974 Strickland’s Automart has been at their currently location on Erie St. in Stratford since 2005. What makes Strickland’s unique to used car dealers is the inventory availability, and convenience to compare all makes and models side by side. By putting the best price right on the windshield Strickland’s Hassle-Free shopping saves guests both time and money. Strickland’s serves Stratford, London, Kitchener, Waterloo, Cambridge, Woodstock, Goderich, Guelph and smaller rural communities like New Hamburg, Tavistock, Wellesley, St. Mary’s and Mitchell. Some people have been known to drive from Toronto, Thunder Bay and Ottawa to save money on a Strickland’s car. In 2006 Strickland’s expanded into Windsor, Ontario, bringing their Hassle-Free high-volume dealership south. After years of steady growth, the dealership has become one of Windsor & Areas favourite vehicle shopping destinations. 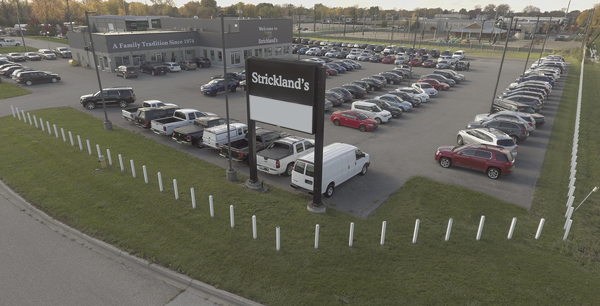 Strickland’s Windsor serves Windsor and many area communities such as; Tecumseh, Lakeshore, Essex, Amherstburg, Bell River, Leamington, Tilbury many guests even travel from Sarnia and Chatham-Kent to buy their vehicles at Strickland’s. 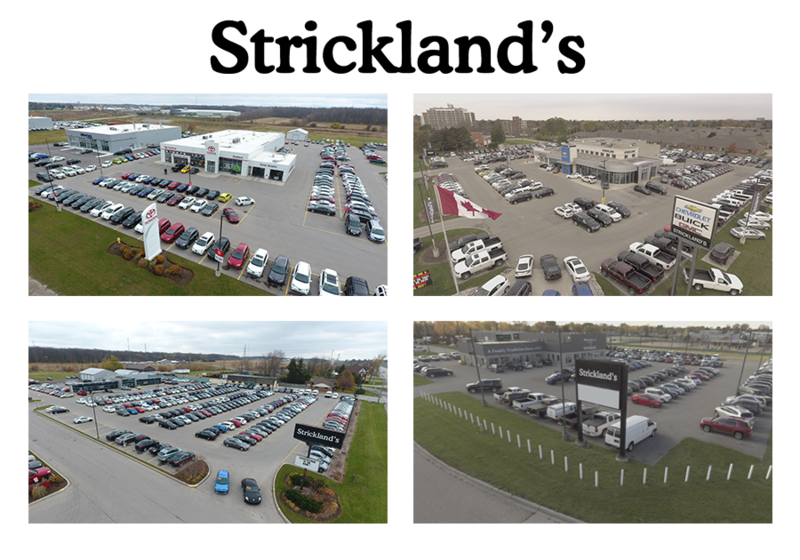 November 2011 brought change once again to the Strickland’s family with the addition of Strickland’s Brantford Chevrolet Buick GMC Cadillac. Operating formerly as Forbes Bros. (established in 1921) with over 90 years in the Brantford community. The addition of the full line of General Motors product, plus GM Certified Service has been a welcome opportunity and challenge as Strickland’s continues to expand their product offerings. 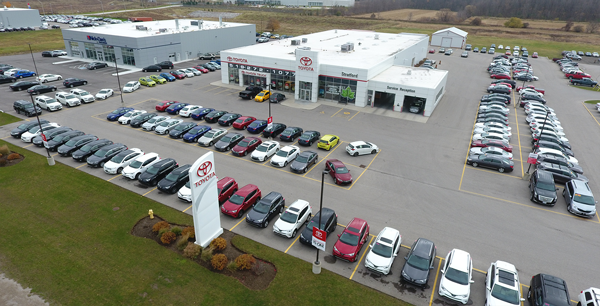 In 2010 Strickland’s expanded from used cars into the new vehicles business with the opening of Canada’s first Green Toyota Dealership, Stratford Toyota. Toyota runs deep in the Strickland family, so it was fitting that Toyota was the brand to introduce as Strickland’s first new car dealership. Along with the sales of new and used Toyota’s we have expanded our vehicle service offerings with an 18 bay auto service facility offering vehicle maintenance and repairs for all makes & models. Throughout the years, we have led the way in the used car business in Ontario, constantly adapting to the ever changing market. Whether it is moving away from the old “high mark-up and discounts” way of pricing, to a progressive “hassle free” strategy, or buying and importing vehicles from the United States when the market dictates, we have never been afraid to change in order to better serve our guests. One thing, however, has remained the same - we have always run our company based on the old proverb “Treat others the way you wish to be treated”. This belief applies to employees and guests alike, which is why we have such a dedicated staff and why we continue to be one of Canada’s friendliest car dealerships. No hassles, no pressure, just good old fashioned service and honest dealings. OUR BELIEF is simply: Value for your hard-earned dollar. We practice full disclosure with all of our used vehicles. We thoroughly research every vehicle that passes through our doors to make sure that they meet or exceed our stringent standards. You will have access to any and all information that we can gather on any one of our cars before you choose to purchase. We also believe that you have the right to ask if you can show your own trusted mechanic the vehicle you are looking to purchase. You do not have to put up with high pressure tactics when buying a car. At Strickland’s we offer hassle-free buying.